The 2011 Audi A8, unveiled last night in Miami, is loaded with gadgets — everything from handwriting recognition, terrain-predicting transmission controls and automatic turn signals. It's like Inspector Gadget's car — if he were a chauffeur-driven investment banker. Although we're left asking whether this is even necessary, we know full well it is if you're a toupee-wearing luxo-barge buyer. We'll be surprised if this feature is used more than a hundred times in the life of the car, people just don't go that many unknown places on a daily basis. Not only that, but we look forward to the first handwriting related accident (we know, it's probably disabled when the car's in motion, but it's still easy to poke fun). Then there's of course the night vision system that's augmented with thermal vision systems, because, you know, headlights are for peons. Shown in the driver information display, the pedestrian detection software highlights people and animals and determines if a critical situation is imminent. 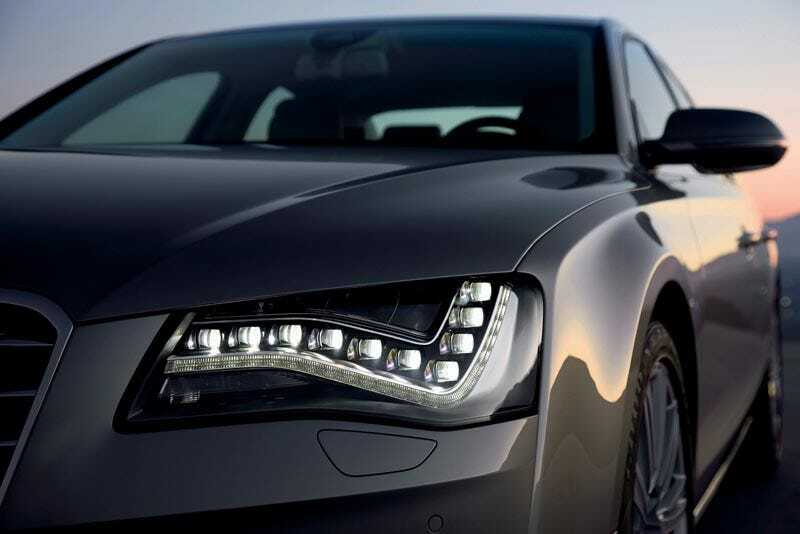 While Audi was not the first to market with this feature, the A8 brings the optimal solution with intelligent pedestrian detection and dynamic range adjustment based on vehicle speed. This is just a scratch on the surface of the A8's long list of gee-whiz gadgetry but such crazy additions to the car's capabilities will certainly draw buyers attentions. Well, the powertrains will turn some heads too, we'll have more on those shortly.